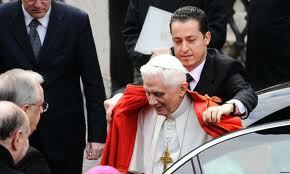 I don’t know why I was surprised to read the pope has a butler. He’s got almost everything else -- international prestige, adulation, God’s ear. You’d need a butler just to tidy up after all the confetti. But it strikes me as odd that anyone would want to butler a pope. Paolo Gabriele is cooperating in a emerging scandal about the leaking of confidential Vatican documents. Authorities think the butler did it. It’s so cliche it makes me suspect the competence of Vatican CSI -- and you have to imagine some network programmer is right now hyping that for a fall release. Reporters who cover the Vatican -- and let’s go ahead and call them “poperazzi” -- have uncovered little about the married 46-year-old father of three. His is a fascinating and historical job, but I’ll bet his kids wish he was a fireman or trash hauler on career day down at the elementary school. The idea of having a butler is something that’s always fascinated me. It’d be like having a drinking buddy who’s always around to pick up your dirty underwear. He’d be my caddie, my designated driver, and my ready alibi if I ever wanted to engage in some illicit fun. I suspect being the pope’s butler didn’t involve any of those sorts of shenanigans. The pope doesn’t golf, enjoy inebriation and has no track record of grabby flirtiness, the latter being quite an achievement for a man whose job description includes laying on of the hands. Lots of butlers to rich and famous men probably take advantage of opportunities to shag stray groupies, but I find it impossible to fathom even the idea that papal groupies might exist much less, yikes, conjure up an image. That’s why I’m surprised anyone would choose a career path that would lead to being the pope’s butler. Sure, few of us achieve our dream jobs, but at what point did Gabriele veer from yearning to be an astronaut or a ballplayer to becoming the pope’s butler? It would be more fun working for a big-eared dullard like Prince Charles. Of course, now he may wind up being a butler to Vincenzo the Butcher or some other mafia enforcer down in Cell Block 4. He and an as-yet-unnamed accomplice are suspected of leaking classified Vatican documents that are portraying the church hierarchy in utter disarray over power struggles, craven money concerns and other earthly matters that have little to do with loving thy neighbor. It’s rocking the Catholic Church -- and it seems venues that host bands like the Foo Fighters haven’t been rocking nearly as much as the Catholic Church. Some say high-ranking heads will roll. It proves that not only did Gabriele lack loyalty, he also lacked playful imagination. • “Pope debating whether to announce conclusive Vatican proof: Santa Claus is real!" • “Vatican scholars find typo in 10 Commandments: Turns out thou SHALL commit adultery!" Unlike Gabriele, no one would have ever suspected me of doing anything so ambitiously conniving. The Holy See himself would testify he never saw me doing any ironing, pillow fluffing or warming the cocoa in time for holy bedtime stories. The police will say it was a rare case where not only didn’t the butler do it. The butler never did a thing.